Porcelain crowns refers to a dental crown which are made up of porcelain or silica material just like vases and clay pots. Dental porcelain crowns are mainly divided into two types. 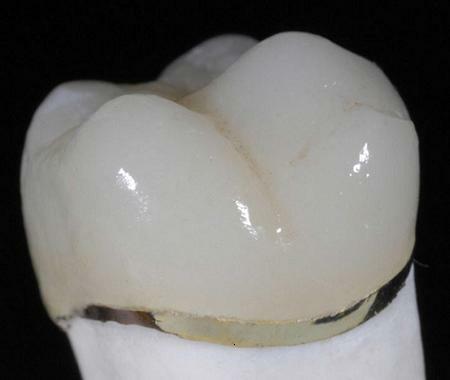 The first being a porcelain fused metal crown (PFM) that uses metal as a base and porcelain covering the metal . The second type is an all porcelain crown , this type of crown only uses porcelain as the main material. Porcelain fused metal crowns is a combination that mix porcelain and metal together. Even though metal is used, it still provides a natural looking appearance because the metal is only on the inner surface of the tooth. However since the porcelain is fused to metal crowns it does not have the advantage of being able to capture and reflect light like natural teeth or all porcelain crowns have. The metal under the porcelain is metallic in color or the color shade is darker than the creamy porcelain shade. Therefore on occasion a darker line will become visible at the edge of the crown near to the gum as the gum recedes with age. Despite this slight aesthetic disadvantage porcelain fused metal crowns are the strongest of the different varieties of dental crowns and are the most common. Porcelain fused metal crowns that utilize a mixture of porcelain and gold crowns are more preferred by the patients as they are more aesthetically pleasing. 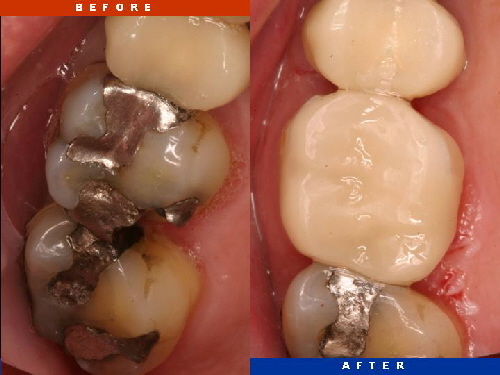 Porcelain fused metal crowns are much more stronger than all porcelain crowns. Therefore, porcelain fused metal crowns are mostly used on the back teeth as more force is used there and also when we smile, the back teeth cannot be seen. All Porcelain dental crowns are generally used for the front teeth and are the most esthetically pleasing dental crown. They mimic the color of natural teeth. This type of dental crown has the advantages of capturing and reflecting light like natural teeth as well as having a natural appearance with a smooth surface. However, fitting this type of dental crown on the tooth is harder as they are required to be more thick than porcelain fused metal crowns. More tooth structure has to be removed and it appears that gum inflammation is more common in all porcelain dental crowns compared to other types of dental crowns. Although these types of crowns are more likely to chip than a metal crown it is still extremely durable. It is also the recommended dental crown for patients with metal sensitivities. However, be warned that those with teeth grinding habit should not use all porcelain dental crowns as they are very hard and abrasive. Therefore it can easily wear of opposing natural teeth in the opposing upper or lower jaw. Porcelain crowns tend to require two to three appointments to create and the most important aspect of it is how accurate it fits the affected tooth. An all porcelain crown is still considered by many dentist to be the most life like and esthetically pleasing restoration. It is translucent( see through), color stable, brilliant and life like. 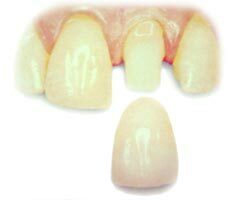 If constructed over a uniformly reduced and balanced crown preparation. It has a long life expectancy in most patients. A properly fabricated and artificially produced porcelain crown is often almost impossible to detect visually in the mouth. The invention of vacuum firing fabrication has reduced bubbles, and produced a fine texture restorations with improved translucency and increased impact strength. Acid etching and adhesive bonding cements have also enhanced the physical properties of all porcelain crowns. Porcelain is biologically acceptable and well tolerated by the tissue. In a study it was found that porcelain wears off at the same rate as natural teeth. Therefore it can withstand normal wear. Additionally porcelain crowns have an advantage over metal crowns based on the way that they are stuck to the tooth. Using a process of bonding as opposed to gluing porcelain crowns require a minimum of removal of a layer of the tooth in the shaping process. This leads to less destruction of the tooth itself. The main problem with the all porcelain crown is its fragility when cemented with conventional cements. The margin or border to the neck of the tooth cemented to the porcelain crown may not be very accurate so a special glass ionomer cement has to be used. Sometimes, excessive natural teeth has to be removed because porcelain crowns require more bulk or thickness. However, most dentist find that its aesthetic value outweighs its disadvantage. What Is the Compostion of Porcelain Dental Crowns? what is the The combination of currency of dental porcelain powders batch? Amir : The fabrication would be done in the lab and in a high temp furnace to harden the porcelain. The compound which is porcelain is mostly made up of silica . Silica is the material which soil is made up off as well. saied : The question that you post is more on the laboratory and technical side. I’m so sorry, but i will try to find the answer for you soon. Beautiful! I am interested in this. I have some problems so I’m just curious in what age I can do all these things or age doesn’t matter?